Well, if you haven’t already know, Toyota happens to be the best selling car in Malaysia after the 2 national car makers of Proton and Perodua. In fact, the largest carmaker in the world is also leading the standings in the other surrounding regions of South East Asia. With their plants in Indonesia and Thailand (and of course in Malaysia), Toyota cars are selling extremely well in the neighbouring countries. As mentioned, Toyota is the top foreign automotive car brand here while holding a 37% share of the TIV (Total Industry Volume) in Indonesia at 762,000 units. according to TAM (Toyota Astra-Motor), for the year 2011, they are targeting 36% of the TIV in Indonesia which is estimated at 800,000. Johni Darmawan, the President and director of TAM said that the increase in vehicle tax, the vehicle ownership transfer fee, the progressive motorized vehicle tax and the rise of fuel prices would all be contributors to the drop in their target this year. Here, the Toyota Avanza too is Toyota’s best selling model in the segment and had just got its upgrades recently so it would still be a while before we see the end of the Avanza. In Indonesia, the best selling model for TAM is the Toyota Avanza where in 2010, they sold 141,174 units, collectively making it about 500,000 units sold in Indonesia since it was introduced 7 years ago. Compared to the year before, TAM also sold an increase of 39% of the Avanza. In the country, Daihatsu motors are also marketing the Daihatsu Xenia, which fundamentally the same model. 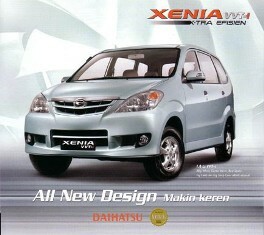 in fact, the Xenia is cheaper than the Avanza where Daihatsu is somewhat owned by Toyota. Daihatsu happens to be the second best selling brand there. TAM’s second best selling car is the Kijang Innova (which typically is the Toyota Innova here). Last year TAM sold 53,549 units of the Kijang while the rolled out 18,836 units of the Toyota Rush. Their compact car Toyota Yaris had the best improvement with a 95% while the luxurious Toyota Camry had an increase of 78% as compared to the year before. In total, Toyota had quite a good year in Indonesia with a total of 541,475 units sold. Comparatively, Malaysia sold 543,594 Toyota’s last year.